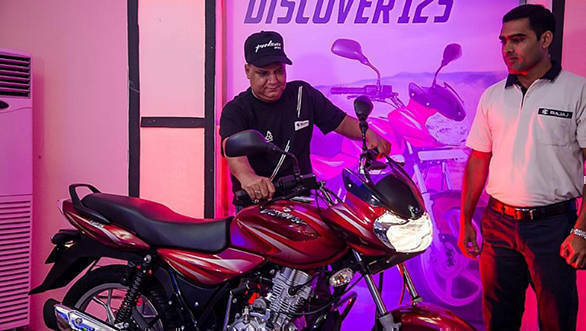 Bajaj Auto has unveiled the Pulsar 220 and the Discover 125 in Ghana through its local resellers SOMOCO Ghana Limited. According to an initiative by the SOMOCO group, each motorcycle that is sold through their dealership will be accompanied by a compulsory purchase of two helmets, one for the the rider and the other for the pillion. This newly introduced initiative aims at improving the safety and also bring down the fatality rate caused by motorcycle accidents. The 220cc unit in the Pulsar 220 makes 21PS at 8,500rpm and generates 19Nm at 7,000rpm. The DTS-i engine is mated to a 5-speed gearbox. The Pulsar 220 comes equipped with front and rear disc brakes. On the other hand, the Bajaj Discover 125 comes with a single cylinder, four-stroke 125cc engine that produces 11PS at 8,000rpm and puts out 10.8Nm at 5,500rpm. This safety initiative was commended by DSP Alexander Kweku Obeng, Director of Research and Training at the Motor Traffic and Transport Department (MTTD) of the Ghana Police Service. At the time of introduction of these two Bajaj motorcycles, the DSP also added that the MTTD will be running new programmes to educate motorcycle riders about safe riding. Hon. Kwasi Amoako-Attah, the Minister of Roads and Highway also urged SOMOCCO to undertake training activities for new riders to educate them about safe riding which in turn will reduce the number of motor accidents on the road in the country.